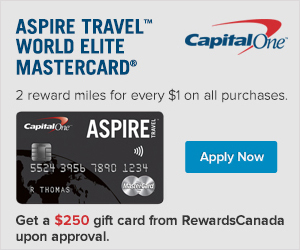 Today we launched an exciting new promotion where you can receive a $250 Gift Card from Rewards Canada when you apply and are approved for the Capital One® Aspire Travel™ World Elite MasterCard®. The gift cards you can choose from are Amazon.ca, Starbucks, Chapters Indigo and the Ultimate Dining Card. Find out more here!